MyWorldAbroad's staff members are committed to high research standards and are working constantly to populate the site with top-quality information. RELATED INFORMATION: Our Product Description page contains a full list of our content and features (view). 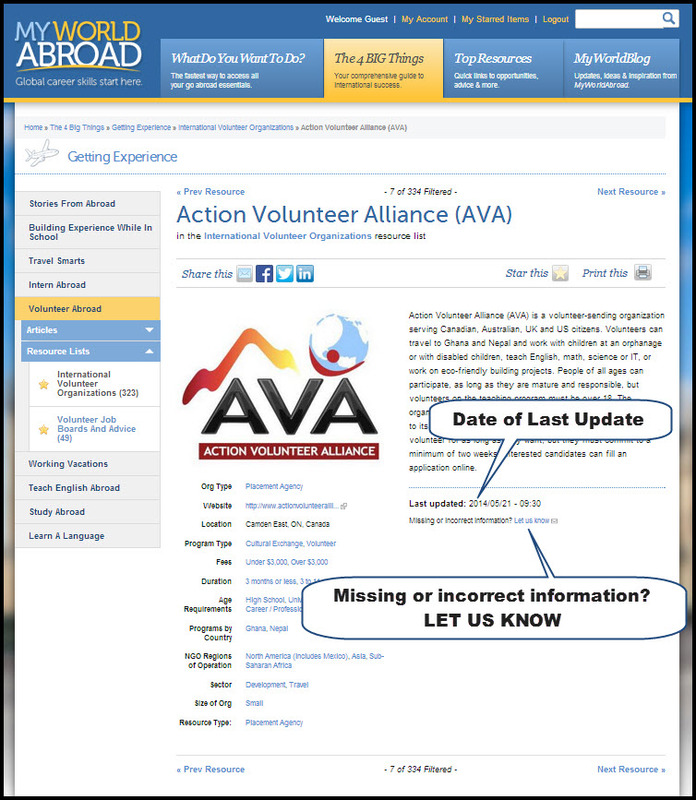 Our Content Updates page lists the MyWorldAbroad Update Log which is a month by month description of what is up-dated on the site (view). How are our resources selected? Writing & Editing Team: Our lead writer is Jean-Marc Hachey and our managing editor/writer is Claire Seringhaus, who has been with the MyWorldAbroad offices for over seven years. We regularly collaborate with subject matter experts when writing new articles and we welcome inquiries from content providers. Richard Berthelsen is also a regular contributor on a wide range of subjects, with special focus on the US and Canadian governments, as well as on trends in social media. Contact us to provide feedback or to inquire about submitting content to MyWorldAbroad. Research Team: We have a small team of permanent part-time researchers, all of whom have international experience (Dez Lamanilao & Marie-Josée Blanchard). We also work closely with junior researchers (Natasha, Brett and Dylan) who provide data collection and coding support. We regularly hire short-term researchers who have international experience, solid writing skills, and who generally have a master's degree. George Ong is our Photoshop technician helping clients implement our Global Nudge Social Media Campaigns. Translator Team: We assist our clients in reaching out to French and Spanish speaking students and work closely with three translators to ensure consistent and high quality translations. Marie-Josée Blanchard and Christian Blanchard provide French translations, and Daniel Castellanos Spanish translations. Web Team: MyWorldAbroad.com was designed by Ian Pham and built by Chris Caple with the assistance of five other Drupal developers (Alan Dixon, Cleaver Barnes, Colan Schwartz, Dave Sykes and Sebastian Galindo). We also work regularly with senior design consultants to help with big picture strategies. Additionally, we ask university students to audit all our major decisions, to stay connected to the student perspective. We also respond seriously to feedback from our client schools and welcome their suggestions. Client Services Team: Click here to contact MyWorldAbroad's publisher as well as our sales and client service representatives. Content Update Log: For the benefit of our clients, we maintain a monthly log of all the updates to MyWorldAbroad, including content updates and new features. View. Management Guides and Systems: Our processes are carefully managed and documented within detailed guides covering every aspect of our Web site. Management guides include: Style Guide (10 pages), Data Entry Guide (91 pages), Drupal-7 Standards (55 pages), ACT Data Entry Guide (15 pages), Office Processes Guides (example file naming procedures) and the all important Standardized Research Process & Control Tools Guidelines. Articles and Quick Guides are permanent and updated as new ideas arrive. Major reviews of articles are undertaken in conjunction with resource list updates (see above). Stories from Abroad: Student submissions are added year-round, as they are received. Please encourage your students to submit a story. Social Media: We are heavily committed to social media and maintain active feeds throughout the year (with somewhat less activity in the summer months): MyWorldBlog: once a day, four days a week; Twitter: two to four times a day, five days a week; Facebook: three to four times a week; and LinkedIn: periodically. ALL LINKS within the 4,000+ Resources and 300+ Articles are checked and up-dated annually (generally in February). Resource Lists are updated every two or three years (see bullet points below). Each profile is reviewed in detail and extensive new research is undertaken. Resource lists located in Getting Experience (view) and All Job Boards (view) are updated every two years. Resource lists located in International Skills (view) and The Professions (view) are updated every three years. Individual resources in all categories are added regularly and upon request. We continuously monitor and perform broad searches for new resources. We are transparent in our resource updates by posting the "last update" date in the Detail Resource View (see screen shot below). some exceptions to the above standards may be made if an organization fills a niche market for our users. Note also that we take reader comments seriously. If there is a complaint about a resource or organization listed in the guide, we will take it into consideration and look into deleting the listing. Likewise, if users have suggestions for reputable, cost-effective programs that we have not yet included, we are also open to suggestions.